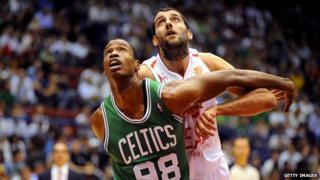 Jason Collins: Where are the world's gay pro athletes? NBA player Jason Collins made headlines this week as the first active competitor in a major American professional sport to announce he is gay. Will other athletes across the globe follow suit? Jason Collins is far from the first pro athlete to come out: indeed, women's sports have had lesbian competitors for decades. Men in individual sports, such as Olympic diver Greg Louganis or professional bowler Scott Norton, are also part of a growing group of gay male athletes. But for years, pundits have wondered when the US would see an openly gay team player from one of the big four professional sports: baseball, football, basketball or hockey. (Players like baseball's Billy Bean or basketball's John Amaechi have come out after retirement). Team sports are viewed as the final frontier, the last blow against a macho culture that insinuates gay men cannot compare in terms of strength and grit with straight men, and would be a disruptive presence on a tight-knit team. Collins' announcement, says Jim Buzinski, co-founder of OutSports, a website devoted to lesbian, gay, bisexual and transgender (LGBT) athletics, is the culmination of a slow, steady march towards acceptance. "It was inevitable," he says. "We weren't going to wait another 20 years. The groundwork has been laid." That groundwork was put in place due to several factors: the existence of gay and lesbian athletes in individual sports, the presence of straight allies within pro teams, and a cultural change in the US that finds fewer and fewer Americans opposed to homosexuality, and an increase in visible LGBT members throughout US society. Still, despite the gains made in gay rights in the past years, Collins stands alone as an out, active professional athlete on a major team sport. And he joins a very small fraternity of men across the world who can make the same claim. In the West, rapid cultural change has created a more welcoming environment for gay players, though there are still very few making public declarations about their sexuality. Nineteen years later, the Welsh rugby player Gareth Thomas came out to little fanfare, followed in 2011 by Swedish footballer Anton Hysen. Thomas stands as "an example of someone who came out, has been accepted by his teammates and moved on just fine", says Brian Kitts, co-founder of the You Can Play project, a support system for gay athletes and their straight allies in team sports. For many, Jason Collin's announcement is seen as a major breakthrough. But will it lead to more players coming out? "The coming out journey of every gay person is different," says Jim Buzinski, co-founder of OutSports. "It doesn't mean 'Jason Collins comes out, oh, I will too'." But others think the positive reaction following Collins announcement - especially if he is picked up by another team - could be influential. And the big media attention granted to the first gay player will put less pressure on the second. "You get sort of a societal shrug," says Brian Kitts, founder of You Can Play. "It becomes interesting but it's not necessarily newsworthy. Earlier this year, pro football player and LGBT ally Brendon Ayanbadejo said that four football players might soon come out together, but so far details have been sparse. But while Western culture as a whole has become more accepting of gay men and women, those who follow the progress of gay athletes say the football culture in Europe and the UK has a long way to go to make the sport more welcoming. "It's much more visceral," says Buzinski of the football fan culture in Europe in the UK, which has been marred by public acts of homophobia and racism. "I'm not saying that when Jason Collins takes the floor, there might not be some fan that says something homophobic, but another fan would turn around and say shut up. It wouldn't be that same reaction where the crowd feeds off it. "In a lot of European places, that kind of anger is hard to tamp down." Many clubs have recognised this as a problem. "There's now campaigns in many many countries to end the homophobic taunting," says Kelly Stevens, officer of communications for the International Gay Games. "It's getting down to a handful of countries and leaders that haven't spoken out against it." He says straight allies like Ben Cohen, the former England rugby player, have done well to make sports seem more inclusive. But the shift in culture will take a long time to complete. "It takes a while before an environment is comfortable enough that people can come out," Stevens says. In other parts of the world, the question of when a pro athlete on a team sport will come out is less pressing than other basic human rights issues. "In some countries it is just dangerous in general to be gay. To be a gay athlete would be impossible," says Stevens. But even in less accepting countries, gay athletes have found a way to make their voices heard. In Russia, it is illegal to hold a gay pride parade, and fans of a professional club in St Petersburg recently called for the team to exclude gays and minorities. But there is also an organised league for amateur gay athletes. "The government will accept it, because it's not political - it's just athletics," says Stevens of such clubs in Russia and Bulgaria. And across the globe, more and more teenagers are refusing to live in the closet or abandon the sports the love. That means that in the future, fewer players will "come out" upon entering professional sports - they will instead already be out.